Personal Pack Anchovies for sale. Buy online at Zingerman's Mail Order. Gourmet Gifts. Food Gifts. Admittedly, this is a minor improvement in the world. When we've got financial crises and human rights issues to contend with, great anchovies, now a few to a pack, rank low on the scale of accomplishments. That said, why shouldn't we cheer small accomplishments? I've always passed on anchovies more than I should because opening a whole tin means a month of user's guilt. I have to stare down a dozen fillets every time I open the fridge, deciding how to use them. Now I can have all the great flavor without the commitment. 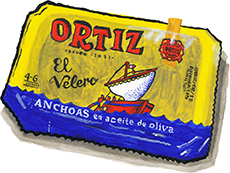 A bachelor's anchovy dream. Cleaned and deboned, here's a packet of four to six fillets of anchovies, fished from the Galician Sea and cured in northern Spain. Perfect for a Caesar salad. Or on top of a midnight egg-salad sandwich. Anchovies are best stored refrigerated regardless of whether they're packaged in salt or olive oil. We store them that way here at Zingerman's. And while they're fine out of the fridge for an extended period (they won't go bad, as they're preserved and will last years), they'll lose their firmness more quickly at warmer temperatures.